Art historian, Rachel Ford has returned to the Irish village of Kilbrook intent on keeping her promise to take revenge on the school bullies who ruined her childhood and destroyed her family. Australian actor, Finn MacKenzie sets hearts fluttering when he turns up in sleepy Kilbrook to help his aunt with a school production. He seems to have a charmed life, yet his confident façade hides heartbreak and tragedy. Although Finn isn’t looking for love, when he meets the mysterious Rachel, there’s a definite spark between them. Rachel is torn between her desire for revenge and this new love affair. She doesn’t want to deceive Finn, but can she trust him to keep her real identity a secret? And will he understand why she must keep her promise, no matter the cost?" An Irish Promise is, not surprisingly, set in Ireland, however, I have to admit it did not feel overly Irish. As a girl with Irish family myself, from a dialogue point of view, I felt it could have just as easily have been set in England, although there are some lovely desriptions of Ireland in it and I particularly liked the reference to the Claddagh (symbolising love, loyalty and friendship). I was therefore not surprised to learn that this did not come from an Irish author; Isabella Connor is the pen name for Liv Thomas (who was born and raised in the South of England) and Valerie Olteanu (who grew up in Scotland). However, this does not detract from the book being a wonderful masterpiece. This is Isabella Connor's second 'Emerald Isle' book, but the first that I have read. Having just finished An Irish Promise I can't wait to get my hands on the first book, Beneath an Irish Sky. An Irish Promise is a story packed full of warmth and love, set against a backdrop of bullying and the quest for revenge. The book made me smile until my jaw ached but it also made me cry (in public, very embarassing!!). The book reveals both sides of the coin; the feelings of the bully and the victim (both then and years later) and the authors do a good job of portraying this. Of course, as with all ChocLit books, romance can't help but creep in! About 150 pages in, a revelation was revealed that changed everything and I can honestly say made me gasp! Later in the book, another (similar) revelation was revealed that I also did not see coming and even made me turn back to the early parts of the book to see whether I should have known! This book was full of twists and turns, and the suspense at the end left me with the book inches from my face and I could not stop my eyes from darting down the page to try and work out whether Ella and Finn get their happy every after. An Irish Promise is quite a long book at just under 400 pages, but every part is perfectly woven together to create a fabulous book that I do not hesitate to recommend. Despite its length, I flew through the book and having finished it, I now wonder whether I should have savoured it for a bit longer. The author makes you love the characters who you should and detest the characters who do not deserve your adoration. 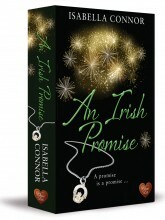 You can read some more about An Irish Promise and the authors comments on it on ChocLit's blog. Thanks so much for such a great review, Kirsty. Glad you enjoyed it. I loved Beneath an Irish Sky and have this new book on my Kindle ready for traveling tomorrow! What a lovely review, Isabella. I can't wait to read it. This sounds like a fantastic read. Like Angela, I loved Beneath an Irish Sky, and it’s great to know I’ve got another treat in store!